This experiment was performed in the recirculating flume at the Arizona State University River Dynamics Laboratory. Flow velocities in the flume were measured using an acoustic Doppler velocimeter (ADV) positioned approximately 1 cm above the bed, the time-averaged velocity near the bed was 31.0 cm sec-1 with a flow depth of 12.5 cm. The bed material used in this experiment is a uniform, coarse sand with an average diameter D50 of 0.05 cm. The stream bed was prepared by smoothing it flat prior to the start of the experiment. Sediment transport of a 7.57 cm long (streamwise) and 6.05 cm wide (cross-stream) area on a streambed is captured with a high-speed camera positioned above the bed. The set of images, taken at a rate of 250 frames per second, with a resolution of 1280 by 1024 pixels per image, spans a total of 19.4 seconds (4912 frames). 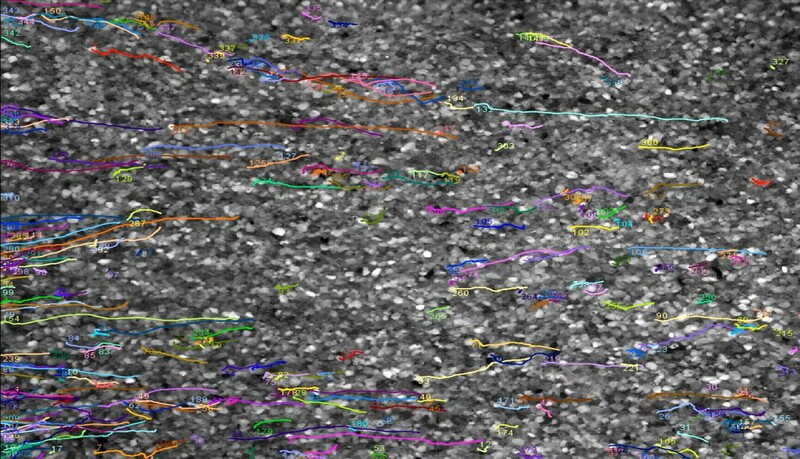 We analyzed five consecutive seconds (1250 frames) of the imagery, where virtually every moving particle was tracked, using the MTrackJ plugin in ImageJ. Particles were tracked only after they began to move. We did not track the motions of particles that ``wiggled'' back and forth within their pockets, but otherwise did not move or hop. All particle motions were manually tracked by one individual to maintain consistency. This manual method provides accurate measurements of all motions without a bias towards short or long displacements. Individual hops were measured from incipient motion to a stopped position such that both streamwise and cross-stream velocities are zero.